I love it when the weather gets warmer but one thing I don't like is that the warmer weather means getting my legs out. My legs are white and blotchy with a tinge of red, even on holiday they don't seem to tan whereas the rest of my body does so I look slightly odd with my little white legs and bronzed arms and face! I usually use gradual tan moisturisers as I have never mastered fake tan,every time I have used it it has either gone streaky or just looks ridiculously orange. 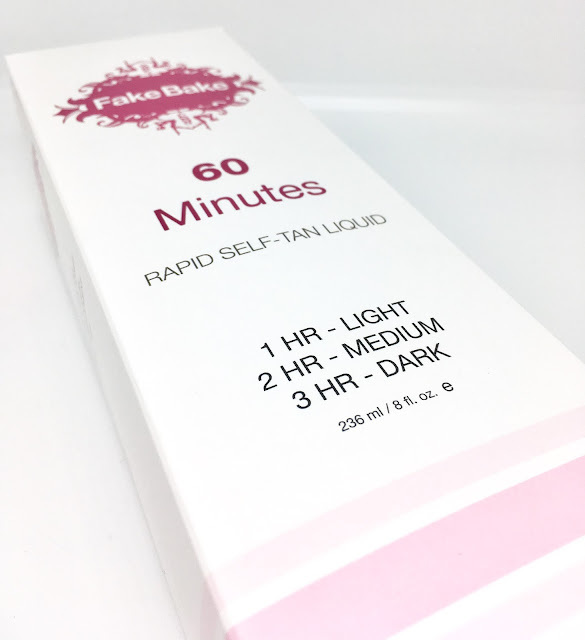 While shopping in Boots I came across Fake Bake 60 Minutes Self-Tan Liquid which is a self tan that claims to develop within a hour, this to me sounded like a good idea and after a quick read of the box it all sounded pretty straightforward so I decided to give it a go. "Launched back in 2012, Fake Bake 60 Minutes Self-Tan Liquid was the very first long-lasting self-tan on the market that develops in just one hour - making it the perfect product to get you party ready! Truly the tan your laundry will love, tanning agents are activated upon contact with the skin, whilst specialist accelerators are triggered following water contact meaning your tan will continue to develop after the cosmetic guide colour is washed away. This revolutionary formula creates a golden tan in only 1 hour, a bronze tan if left on for 2 hours and a deeper colour when washed off after 3 hours. It’s little wonder it is the tan that’s talked about the world over! 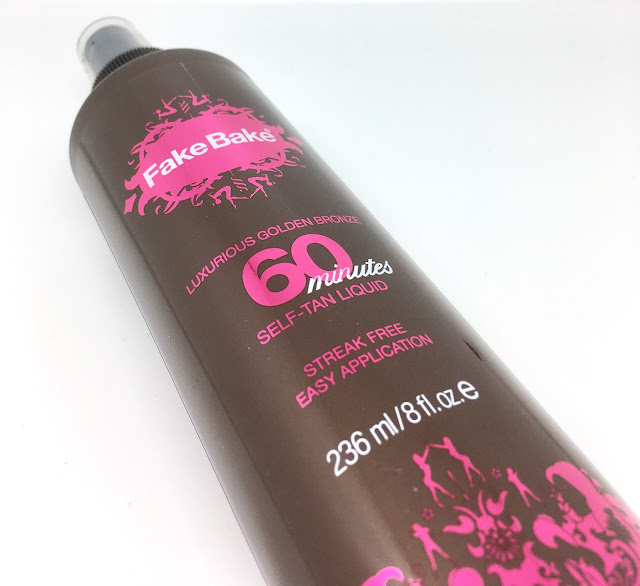 Fake Bake's unique tanning formulas work with your natural skin pigment, ensuring the colour provided by the tan is believable." So the concept is pretty simple, you spray the product directly onto the mitt provided and smooth onto your skin, it's recommended to do circular motions on your body and long overlapping strokes on your legs and arms. You then leave it to dry for either; 1 hour for a natural tan, 2 hours for a medium tan or 3 hours for a dark tan (Fake Bake do not recommend leaving it on over 3 hours). 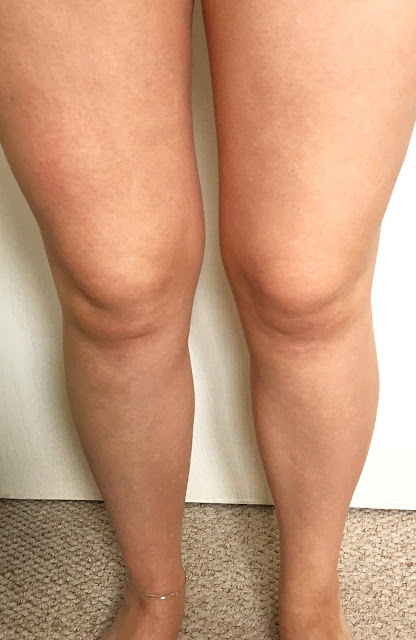 As my skin is very fair I only wanted to test it for 1 hour for a natural looking tan and below are my results and how I found using the product. 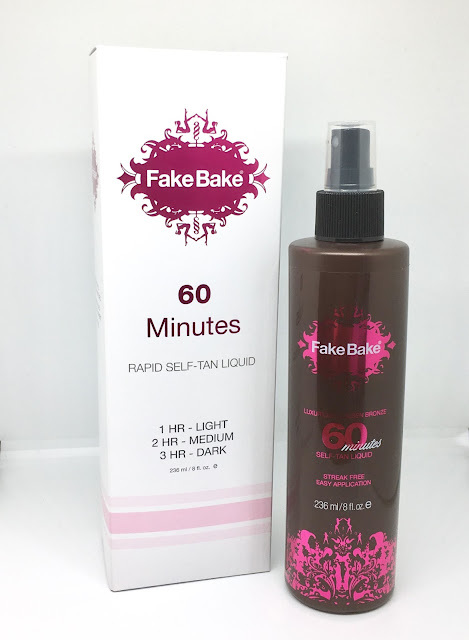 APPLICATION - Fake Bake provide you with a pair of plastic gloves to put under your mitt to stop the product from staining your hands and I found the application process quite simple. I used about 4 or 5 pumps of the spray, directly on the mitt, and started using long strokes down my legs, making sure to overlap them and cover each area fully. The product is really dark on the mitt but when applying it to my leg it was a very light grey which was perfect for me to see where I had applied....or missed! DRYING TIME - I found the drying time really quick. The product had soaked into my skin within 10 minutes so I was able to do other things while waiting for it to develop. REMOVAL - Once I had left the product on for an hour I rinsed it of with warm water - no shower gel or soap is needed as this could effect the end result. SMELL - It smells pretty nice, like coconut and not too overpowering. Once I had removed the tan I noticed a slight difference in my skin, less than what I was expecting to be honest however the next day it had developed a lot more to a really nice golden tan, so even though you can apply this product easily, and it only takes an hour to start developing, for best results I would apply this 24 hours before you want to get your pins out - see pictures below. 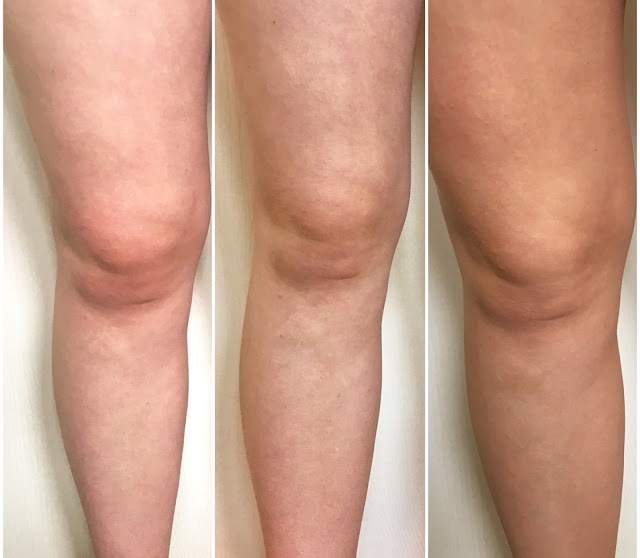 Please excuse my little weird little legs but I thought it was best to do before and after pictures for you. From left to right - Before application - After removing the product (1 hour) - The next day. The reason for the tan looking darker after leaving it overnight is because it contains a unique ingredient, which is activated when water hits the skin, so the shade continues to darken - like I said above, definitely apply this the day beforehand. As a fake tan novice I am really happy with the results (the picture doesn't do it justice), it applies evenly and it looks natural however I wouldn't leave it on my skin any longer than an hour as I think it would give me the tangoed look - not cool. The tan is said to last for up to a week, I will update this post to see if this is true once I start to notice it fading, but so far it looks great! I can finally get my legs out without feeling like Caspar the ghost. EDIT: The tan is still visible on my legs after 7 days, it has faded but I didn't notice a massive fade until at least day 5 - great results! Do you use fake tan? If so, what is your brand of choice?